New Slang, an online publication and writer's collective devoted to theme based nonfiction, in partnership with Ayala Museum presents Grade School For Yuppies--an open mic night that's part show-and-tell, part storytelling where we begin with a simple questions to arrive at larger answers. These are questions we may or may not have asked ourselves before, through which we hope to arrive at larger truths about our selves, our creative processes, and our shared and personal histories. Now in its third run, the prompt for this month's Grade School for Yuppies is "Because we should never forget...," dealing with the uses of memory and lessons from the past. Esteemed filmmaker Luis Bunuel once wrote that memory serves as "our coherence, our reason, our feeling, even our action. Without it we are nothing." When we dig into a seemingly boundless trove of memories, what insights do we arrive at? More importantly, how do we wish to express these insights and turn them into actions? More than just a symposium or a lecture series, Grade School for Yuppies is a space for sharing ideas and artifacts from our own personal histories, in the hopes of nurturing a stronger creative community. 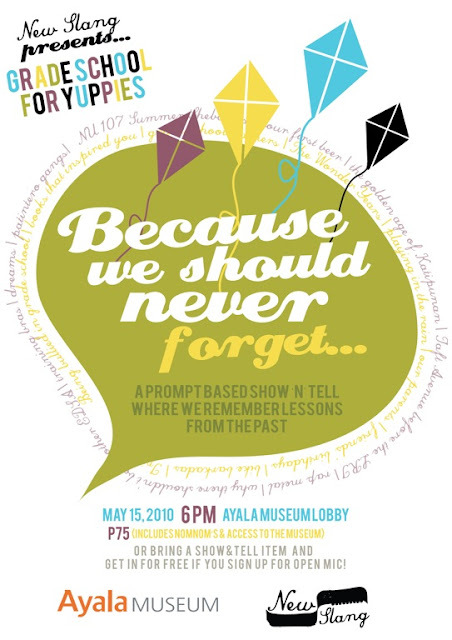 Come early and take a tour of the exhibits before joining the discussion; or just sit and listen on May 15, 2010 6 pm at the Ayala Museum lobby. There will be good wine, good food, and good company; and when the mic is open you can never be too sure about what to expect. This event is free with museum admission. A discounted rate of Php75 will be available for purchase at 6:00PM. A limited number of slots will be allotted for those who wish to join show-and-tell. For more information about Grade School for Yuppies, visit http://new-slang.com, email because@new-slang.com or RSVP, +63 917 822 2915. Ayala Museum is located at the corner of Makati Avenue and De la Rosa Street, Greenbelt Park, Makati City. Please call (632) 757-7117 to 21 local 28 for more information or email inquiries@ayalamuseum.org. Please visit the museum's website at www.ayalamuseum.org.